March 21st is observed as World Down’s Syndrome Day every year to raise awareness about the genetic condition. Down’s syndrome (DS) is one of the leading causes of intellectual disability in children across the world. According to 2016 study published in the Journal of Neurosciences in Rural Practice, it accounts for around 15-20% of intellectual disability in the world. A survey of 94,910 newborns in three metropolitan cities of India revealed that the frequency of DS was 1 per 1150. It is a genetic condition in which a child is born with an extra copy of chromosome 21, hence also known as trisomy 21. People with Down’s syndrome not only suffer from developmental disabilities but are also susceptible to various chronic disorders, infections, and physical disabilities. Here’s more on the causes, symptoms, diagnosis, and treatment about Down’s syndrome everyone needs to be aware of. Chromosomes contain genes, which are passed from parents to their kids during reproduction. Overall, there are 23 pairs of chromosomes in a person and during reproduction, each cell receives 23 chromosomes from either parent which makes it a complete set of 23 pairs in a child. However, in kids with Down’s syndrome, one of the chromosomes fail to segregate properly. This causes the baby to be born with three copies of chromosome 21 instead of two. It is due to this extra copy of chromosome 21 that a child develops physical and developmental problems. Down’s syndrome is classified into three main categories. Trisomy: In this, there is an extra copy of Chromosome 21 in every cell, which means there are three complete copies of Chromosome 21 in all the cells. It is the most common type and accounts for 95% of the total cases of Down’s syndrome. Translocation: This type of Down’s syndrome accounts for 3% of all the cases of Down’s syndrome. In this, instead of the entire chromosome, there is a part of Chromosome 21 that is attached. Mosaic: This type of Down’s syndrome is less prevalent and accounts for and 2% of the cases. In this, the kid is born with an extra pair of Chromosome 21 in some and not all cells. This is the reason, why kids with mosaic Down’s syndrome show fewer symptoms as compared to other types. Mother older than 35 years: According to the Centre for Disease Control and Prevention (CDC), women aged 35 and older are at a higher risk to give birth to a baby with Down’s syndrome as compared to younger women. The risk increases with the age of the women at first pregnancy. Father’s age: A 2003 study has revealed that paternal age does have an effect on the risk of Down’s syndrome. As per the study, men above 40 years of age were twice likely to father a child with the condition as compared to younger men. Family history: If you have a family history of Down’s syndrome which means either of your parents or siblings have Down’s syndrome, the chances of your kid to suffer from the condition is high. Also, if you have a kid with Down’s syndrome, then the chances of having a second child with the condition are also very high. 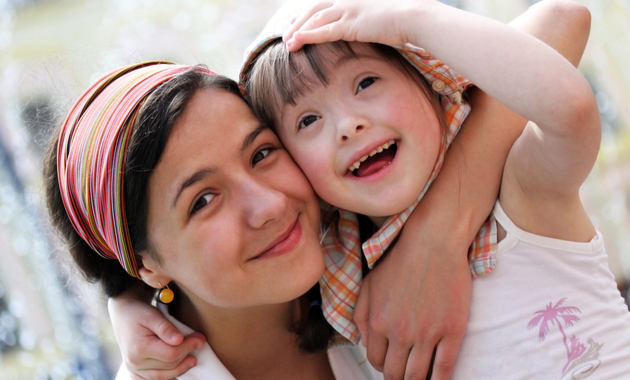 Unlike other health conditions, a woman who is carrying a child with Down’s syndrome may not experience any signs and symptoms. The reason being, it is a genetic condition and can only be seen in a kid with the condition. However, there are certain tests that can help to detect the chances of a kid suffering from chromosomal abnormalities in the womb. There are certain screening tests which can help to detect Down’s syndrome in the growing fetus. These tests are usually recommended during pregnancy, however, it is a must for pregnant women above 35 years, if the father is above 40 years or if there is a family history of Down’s syndrome. During the first trimester, an ultrasound and blood tests are advised during this stage to detect the condition. Whereas during the second trimester, an ultrasound and quadruple marker test are recommended to detect defects in the brain and spinal cord. Any abnormalities in these tests can indicate an increased risk of birth defects. Amniocentesis: This test is done after the first 15 weeks of pregnancy. In this, a sample of amniotic fluid is taken to examine the chromosomal count of the child. Chorionic villus sampling (CVS): The test is usually done between 9 – 14th week of pregnancy. In this, cells are taken from the placenta to examine fetal chromosomes. The test is known to slightly increase the risk of miscarriage. Talk to your doctor to know the pros and cons of all the tests before undergoing these tests. Once the child is born, a routine physical examination of the baby is done. In addition to this, your doctor might recommend a blood test known as karyotyping to confirm Down’s syndrome. Down’s syndrome is a genetic disease which means that it is a lifelong condition and cannot be cured or treated. But thanks to recent advances in the treatment and research, there have been cases where the quality of life of a person with Down’s syndrome has been improved. Children with the condition fail to meet the developmental milestones, especially the cognitive abilities, which makes them slow learners. Hence, therapies which aim at improving the intellectual abilities and building social skills are recommended. These include specialised education programs and integrated classrooms along with love, care and support from friends and families. You can even get in touch with communities which help in making the life of a person with Down’s syndrome a bit easier. It is also essential to build a strong connection with doctors and closely monitor their health as they are at risk of various health problems and infections. With current treatment options, the life expectancy of a person with the condition has reached an average of 50 years. Remember that with proper support and care, people with Down’s syndrome can live a longer and better life. Are We The Culprit Behind Our Child’s Obesity? 1. Lakhan R, Kishore MT. Down syndrome in tribal population in India: A field observation. J Neurosci Rural Pract. 2016 Jan-Mar;7(1):40-3. 2. Verma IC. Burden of genetic disorders in India. Indian J Pediatr. 2000 Dec;67(12):893-8. Erratum in: Indian J Pediatr 2001 Jan;68(1):25. 3. Fisch H, Hyun G, Golden R, Hensle TW, Olsson CA, Liberson GL. The influence of paternal age on down syndrome. J Urol. 2003 Jun;169(6):2275-8. 4. Manikandan K, Seshadri S. Down Syndrome Screening in India: Are We There Yet? J Obstet Gynaecol India. 2017 Dec;67(6):393-399. 5. Asim A, Kumar A, Muthuswamy S, Jain S, Agarwal S. “Down syndrome: an insight of the disease”. J Biomed Sci. 2015 Jun 11;22:41. 6. Your Guide To Understanding Genetic Conditions. Genetics Home Reference. US National Institute of Health.